Trimming your baby’s nails is something you need to start doing within a few days after his birth. Following the proper techniques, alongside certain precautionary measures from the beginning would help your infant have clean and well-shaped nails. It is necessary to cut you baby’s nails as soon as it grows long, otherwise, he may end up scratching his face or anywhere else as those small nails are quite sharp, and he still lacks control of his hand and leg movements [1,2]. Newborn nails grow pretty fast, needing trimming at least one or two times a week, while some babies may need it more frequently . The fingernails require more attention than toenails because of their quicker growth. The easiest way to manage your child’s tiny nails in the initial weeks after his birth is to file them using an emery board rather than cutting [1,7,8]. For older kids filing may be needed to neaten the uneven edges after cutting . If you want to skip filing or cutting altogether, then cover his hands with socks or mittens in the initial weeks. As he reaches about one month of age, you can turn to clipping, as his nails gradually tend to harden . When clipping, a proper light source is needed so that you can see the nails properly. Hold your little one’s finger firmly and to avoid any cuts or bleeding, pull back the skin of the fingertip slightly so that it does not touch the nail when clipping. Then, place the clipper gently under the nail you desire to cut. Follow the direction of the natural curves for fingernails, and trim straight across for toenails [1,6]. Safe baby nail clippers include those having a soft handle  for a proper grip, and the ones having a magnifying glass to give a clear view of the tiny nails [13,14]. Use scissors with a round tip to lessen chances of injury, particularly if he gets restless during the cutting session [1,7,8]. The remaining procedure is exactly the same as clipping. If the nails are clipped too short, there is a chance of cutting the skin, thus resulting in bleeding. Do not panic, but immediately rinse the cut finger in cold water for some time, and then hold it gently with a sterile gauze to stop the blood [1,3,6]. However, avoid dressing it with a bandage as the young ones have a habit of putting their finger into their mouth quite often that may result in a choking hazards [1,4]. 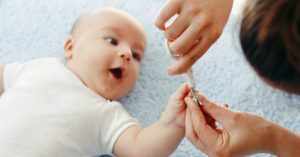 Liquid bandage products are also not recommended by doctors as babies may often end up sucking it . If the bleeding does not stop even after implementing these remedies, take your baby to the doctor at the earliest. Apart from cutting, cleaning and caring for your newborn’s nails is essential to maintain hygiene. You can wash his fingers well with a baby soap during bath time or even go for an unused baby toothbrush with soft bristles to clean the dirt that accumulates under the nails. In case your baby has an ingrown toenail (nail growing into his skin), take proper care of it by giving him a hot water foot bath thrice a day for approximately ten minutes and applying an antibiotic ointment afterwards . Take special care of his cuticles, if any, by keeping them moisturized using a proper hand cream as prescribed by your doctor . Most kids hate cutting their nails, getting very cranky whenever it is done; hence, it is better to opt for a time when they are asleep or engaged in an activity they are fond of [4,8,10]. If doing it when he is awake, make sure to have someone to hold your baby and keep him engaged so that you may do your work easily . You should never cut his nails too short, bite it for a proper shape, or trim the cuticles, as in doing so you may be giving free entry to germs to get into the skin under his nails, leading to infection [8,15]. 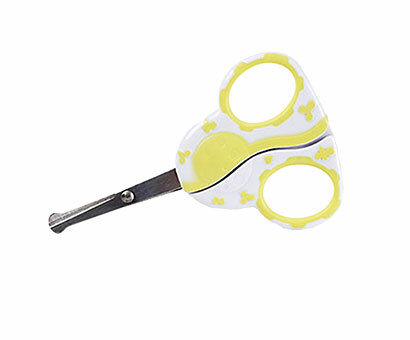 You can get a baby nail care kit containing a file, clipper, and cutting scissors to make your work easier and more organized.